* Manicure & Pedicure Nail Salon * is the latest "nail salon" makeover game with new gel nail art designs, awesome nail polish ideas, cute stickers and glitter nails with various patterns and accessories for your beautiful nails. These mani-pedi games have a truly amazing spa "nail art fashion salon" ready for you! Download our nail salon games and let these "nail polish games" turn you into a real fashion diva with gorgeous fingernails and toenails! 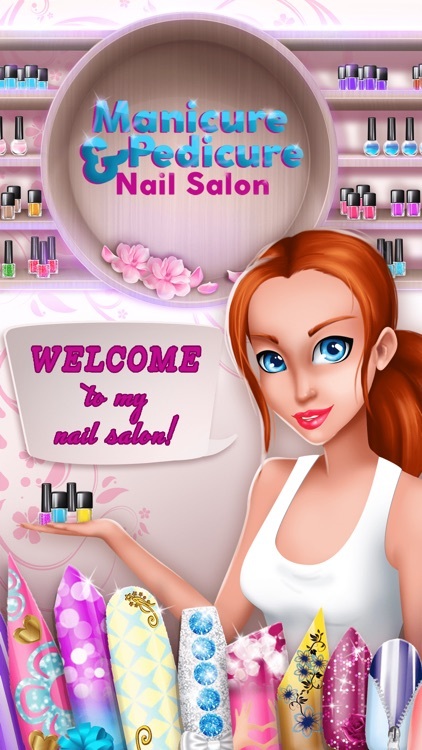 * The latest and greatest nail salon makeover game FREE! * Try two different modes of playing! * Mani-pedi spa salon: put on cream, treat hangnail or file your nails! --- Stylish rings, bracelets and cool tattoos! * Unlock new tasks every day! * Choose the skin color you desire! * Unlock vibrant color palettes: pastel, metallic or fluorescent! * Have fun with unlimited nail care combinations! * Save your designs in your phone gallery and share them on social networks! * Nail painting game that's easy to master: an animated fashion diva will guide you through the process! There are many hand spa and nail art games with finger or "toe nail salon" makeover options, but not nearly enough nail polish games that offer you a wide variety of gorgeous design patterns and an unlimited number of cute nail polish colors, stickers, and other accessories. 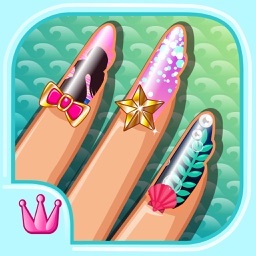 Finally, the most beautiful-looking fashion nails are now available in our "nail salon games" for free! 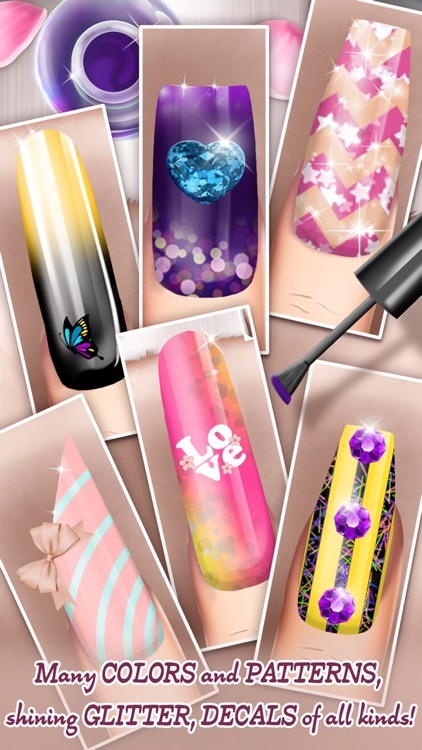 Download this * Manicure & Pedicure Nail Salon *, a terrific spa nail salon, and enjoy one of the best nail designing games ever! Haven't you always wanted to have the most beautiful realistic nails and the nail fashion design skills of a pro manicurist or pedicurist? Want to create amazing nail salon makeover designs and impress everybody around you? Want only the most magnificent manicure and pedicure games for girls? If your answer to all these beauty spa salon questions is YES, than allow our new fashion nail art designs game to take you to the greatest mani-pedi adventure in nail games! Get this * Manicure & Pedicure Nail Salon * and your only regret will be not becoming such a pro nail designer sooner! Become a prom princess with gorgeously decorated nails! Cute nail polish ideas for beautiful nails that you have in our nail salon art games will turn you into a real "nail designer" while having incredible makeover fun! 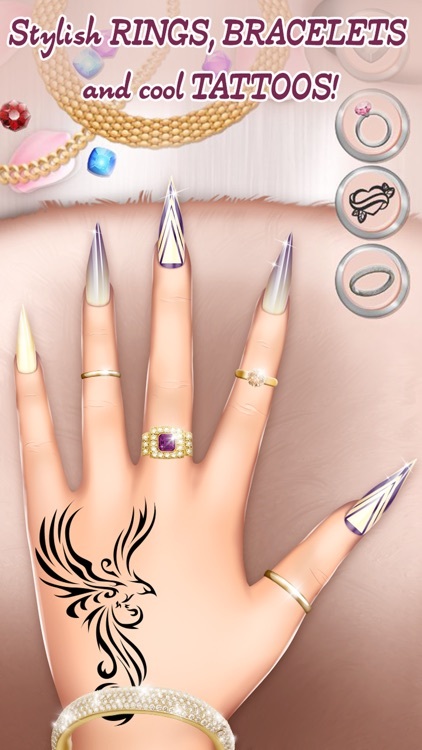 Apart from common fingernail and toe nail art, our nail dress up games let you tastefully decorate your beautiful nails with absolutely fantastic glitter, nail stickers, stylish bracelets, rings or tattoos and so on. Do your own nails in this DIY hand and foot spa studio! Apply stunning tattoo designs, so you don't even need other tattoo design games. Let your imagination run wild in this virtual nail salon, and discover how you can dress up nails like a pro and achieve amazing fashion nail design. You don't need other nail art tutorials to paint nails and create fabulous nail designs. Simply download * Manicure & Pedicure Nail Salon *, and get tons of likes on social networks for your very own nail design ideas. Only in our nail salon games for girls!